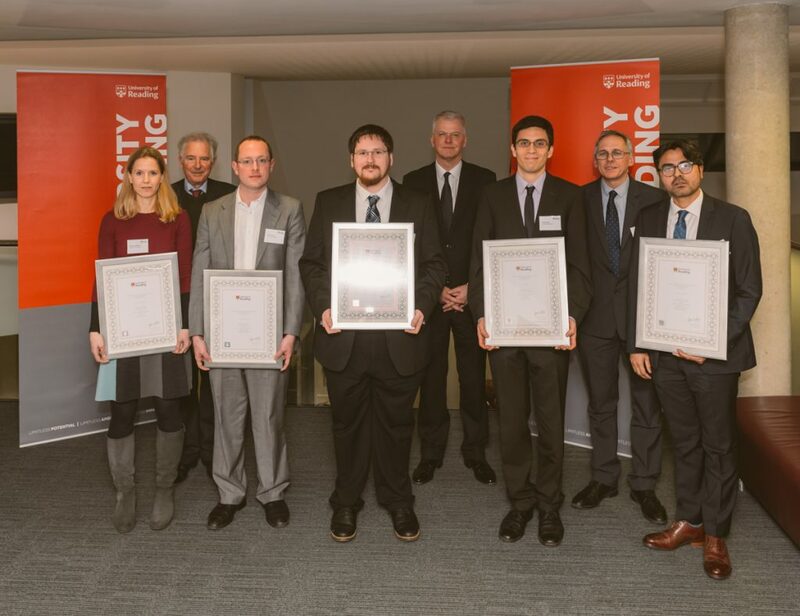 The effect of clouds on global warming, a ‘light switch molecule’ to diagnose disease and the entanglement of malaria with colonialism were among the research topics that have won University of Reading academics prizes. Left to right: Dr Ariane Kehlbacher (Food theme winner), Lord William Waldegrave of North Hill (Chancellor), Dr James Hall (Health theme winner), Dr Tim Vlandas (Prosperity and Resilience theme winner), Sir David Bell (Vice-Chancellor), Dr Paulo Ceppi (Environment theme winner), Professor Steve Mithen (Deputy Vice-Chancellor), and Dr Rohan Deb Roy (Heritage and Creativity theme winner). The five academics, one from each research theme, were honoured with a Research Output Prize for Early Career Researchers at University Court, the showcase annual event for the University community, on 19 March. Dr Ariane Kehlbacher, from Agri-Food Economics and Social Science, whose research showed that taxing foods based on the greenhouse gas emissions they produce would hit poorest households the hardest. That is because lower income households spend a larger share of their food budget on emission-intensive foods – such as meat – than their wealthier counterparts. Less well-off households also tend to buy cheaper products which means they would see a greater price hike on their weekly shop if emissions-based food taxes were to be introduced. The judges described the paper as “a rigorous and methodologically novel analysis on a very topical subject relating to ‘polluter pays’ taxation policy” and “a very policy-relevant output”. Pharmacy researcher Dr James Hall has discovered how a light-emitting molecule can bind to DNA in five different ways, each with a different brightness, like a ‘dimmer switch’. This is a critical step towards developing molecules that can detect different DNA structures – such as those linked to different diseases. Deemed to offer “significant applications for future diagnostics” the judging panel also noted that the article had already been cited 10 times, despite only having been published recently, and was therefore already making an impact in the field. Dr Rohan Deb Roy, from History, for ‘Malarial Subjects’ – a book exploring malaria within the context of British imperial rule of India and the entanglement of colonialism with mosquitoes, quinine and cinchona plants. Judged by the panel as “a work of exceptional originality and significance” the book explores connections between humans and non-humans, and science, medicine and empire. More details on each of the research projects, including video of each of the winners will be published over the next few weeks on this blog.